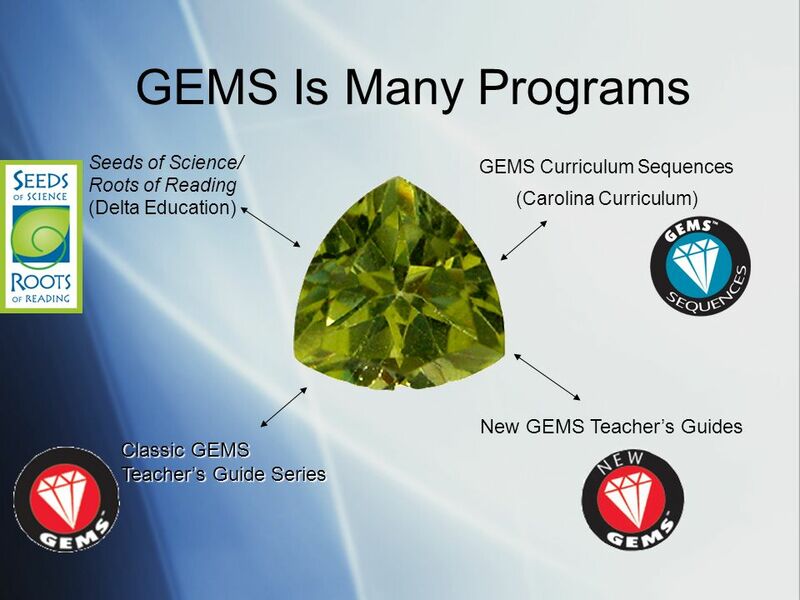 The Scope of GEMS I’m going to lead you through a quick overview of GEMS programs, with a focus on GEMS guides. Sometimes people ask, “what is the GEMS. 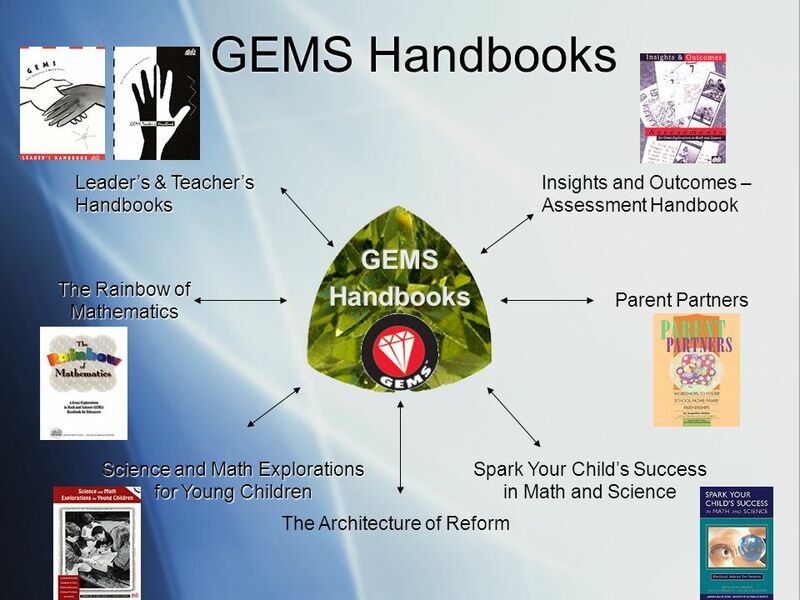 1 The Scope of GEMS I’m going to lead you through a quick overview of GEMS programs, with a focus on GEMS guides. Sometimes people ask, “what is the GEMS philosophy?” Many aspects of the GEMS philosophy are included in this presentation. 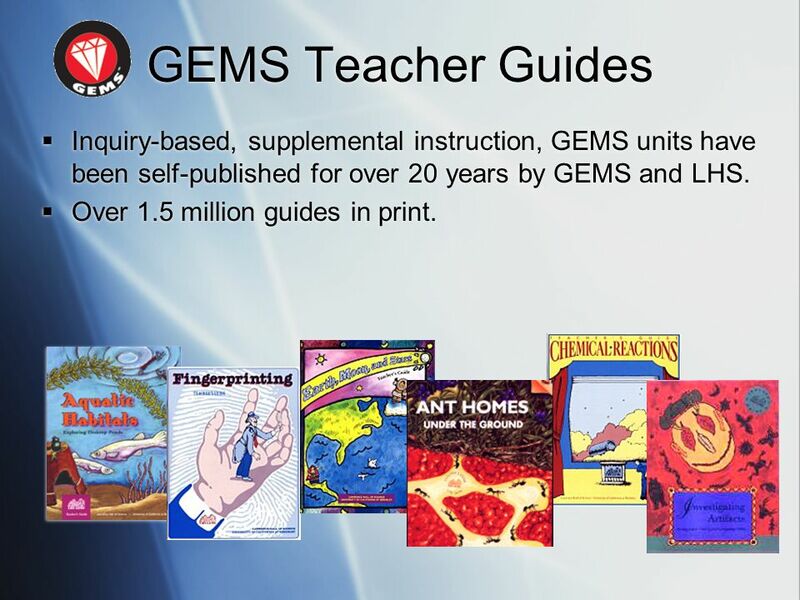 3 GEMS Teacher Guides Inquiry-based, supplemental instruction, GEMS units have been self-published for over 20 years by GEMS and LHS. Over 1.5 million guides in print. 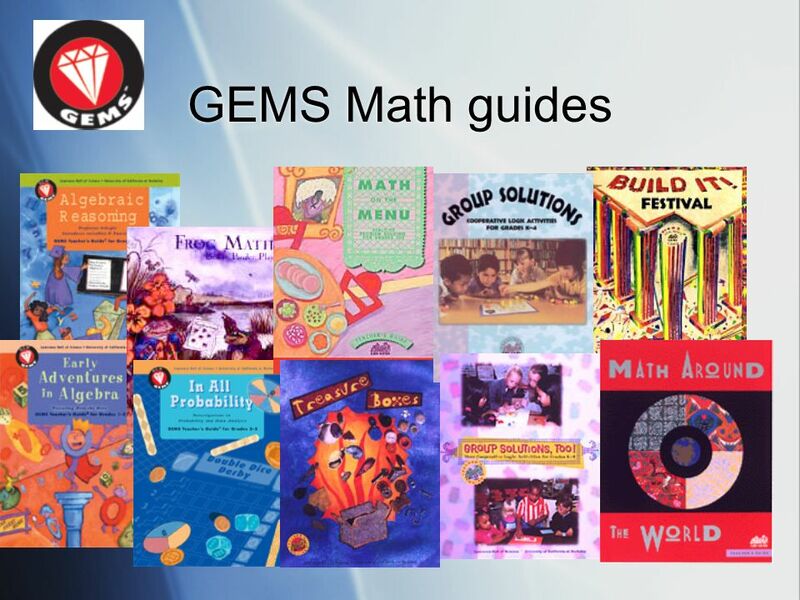 GEMS made its name with GEMS teacher guides, and we currently have about 70 published guides. 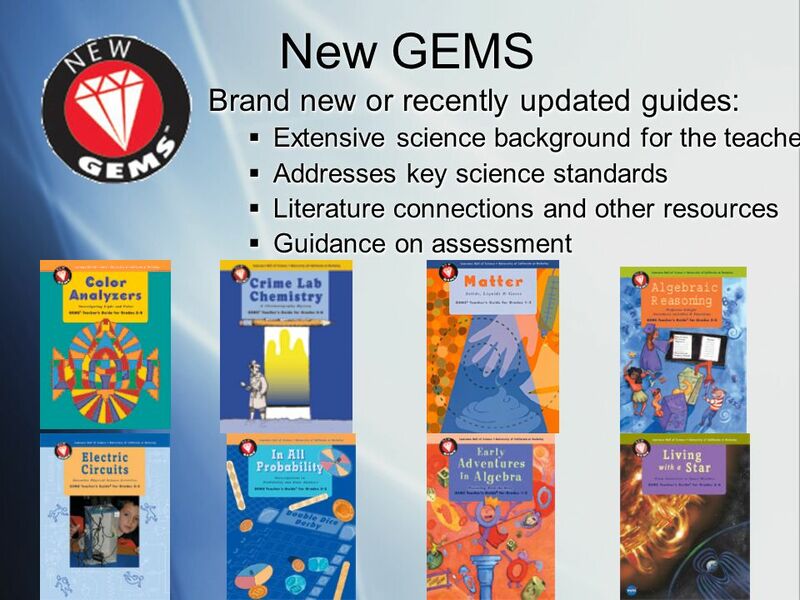 Extensive science background for the teacher Addresses key science standards Literature connections and other resources Guidance on assessment On some guides you’ll see the New GEMS logo. These are recently published guides, or classic guides we have updated. 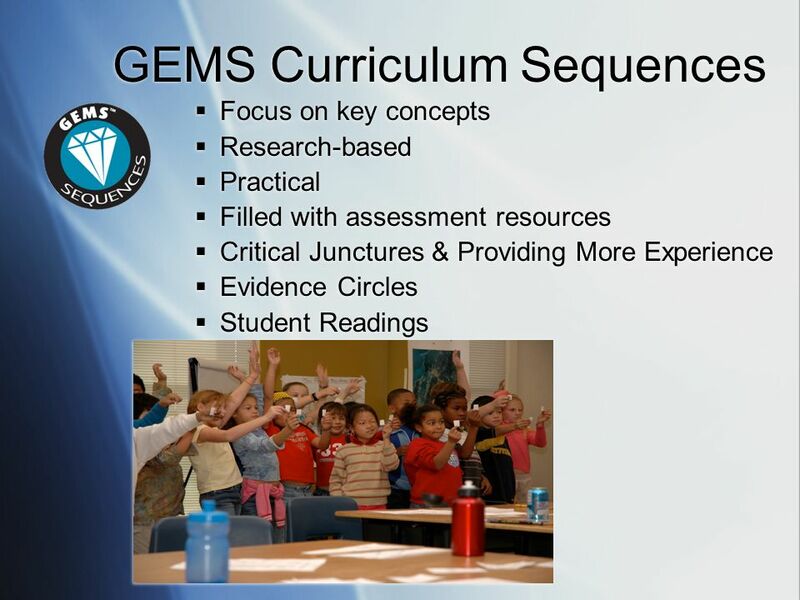 Focus on key concepts Research-based Practical Filled with assessment resources Critical Junctures & Providing More Experience Evidence Circles Student Readings A recently developed branch of GEMS are the GEMS curriculum sequences. These are sequences from grades 3-8 based on the most important and most challenging space science concepts for children to know. 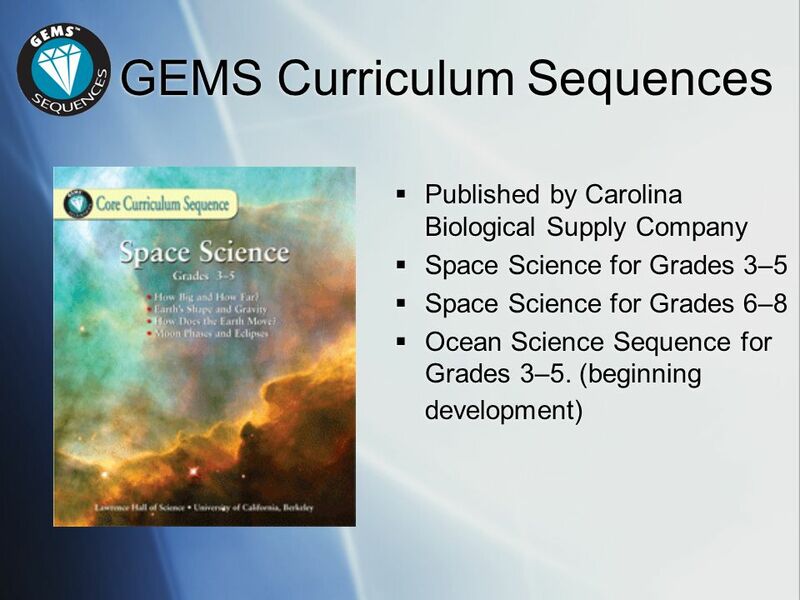 Published by Carolina Biological Supply Company Space Science for Grades 3–5 Space Science for Grades 6–8 Ocean Science Sequence for Grades 3–5. (beginning development) Currently we have a 3-5 grade space science sequence published, and 6-8 just went to press. OSS is in the beginning stages. 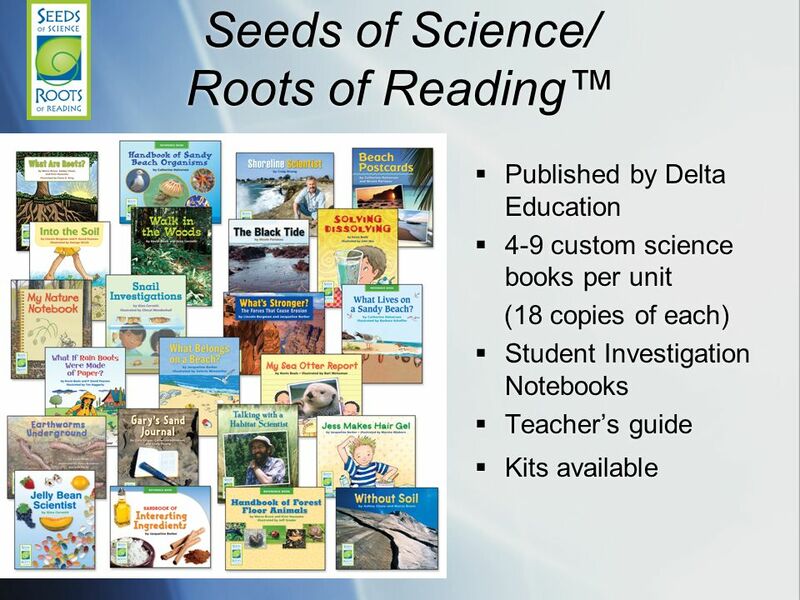 4-9 custom science books per unit (18 copies each) Among many features of Seeds are the 4-9 children’s books we have written about science topics that are intergral to each unit. 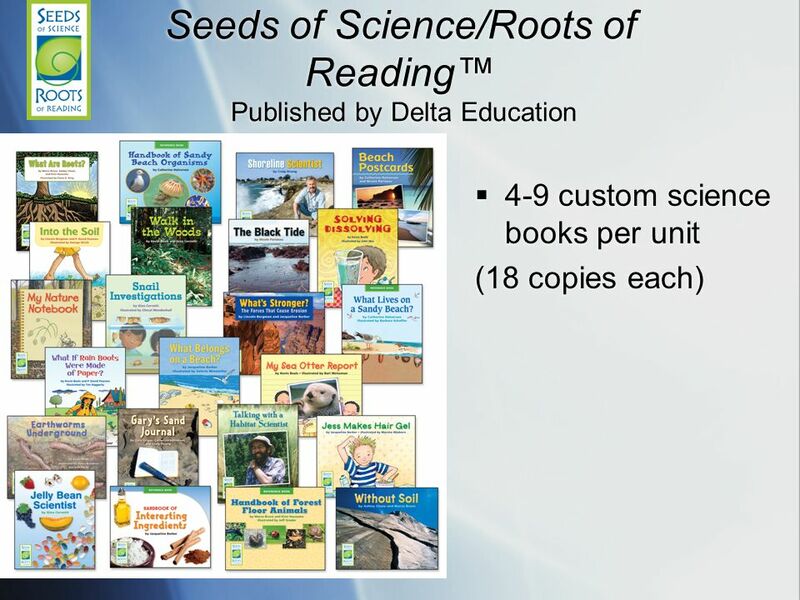 Published by Delta Education 4-9 custom science books per unit (18 copies of each) Student Investigation Notebooks Teacher’s guide Kits available Among many features of Seeds are the 4-9 children’s books we have written about science topics that are intergral to each unit. May be linked in a sequence Designed to be taught as supplemental units of study or linked together in a larger sequence. 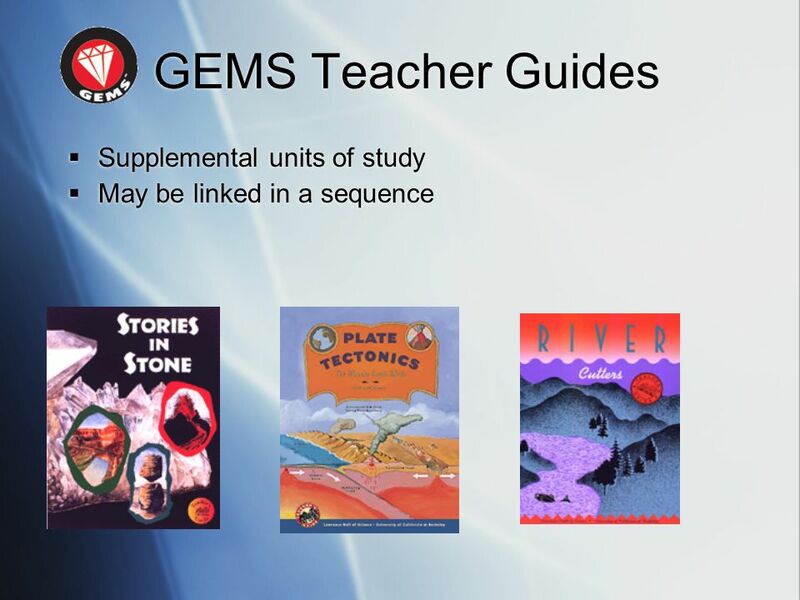 For example, each of these 3 units is a stand alone, but they could be sequenced, with students learning about the rock cycle through Stories in Stone, followed by Plate tectonics, then how water has shaped the land through River Cutters. 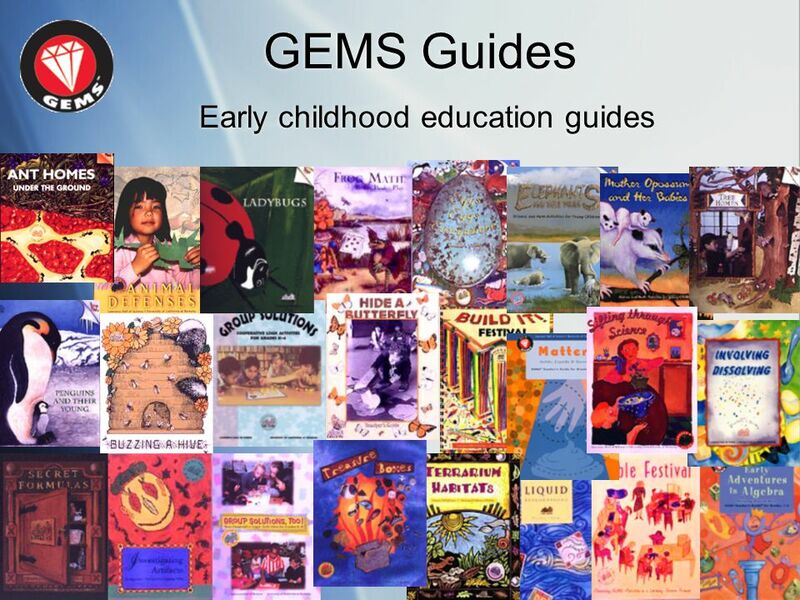 GEMS Guides Early childhood education guides The GEMS series includes guides that are appropriate for early childhood education, including preschool - 2nd grade. 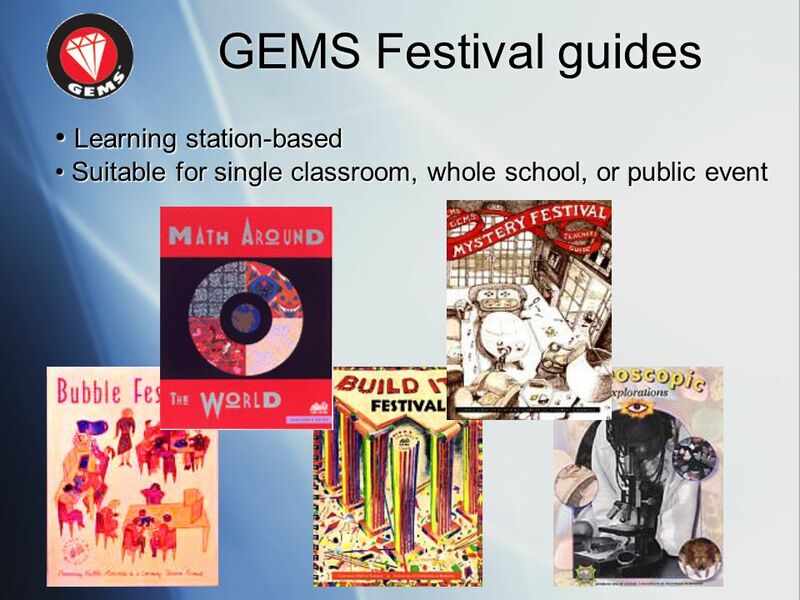 • Suitable for single classroom, whole school, or public event GEMS festival guides use learning station formats. Festival guides are written to be presented in a single classroom, but they are also designed for whole school events. 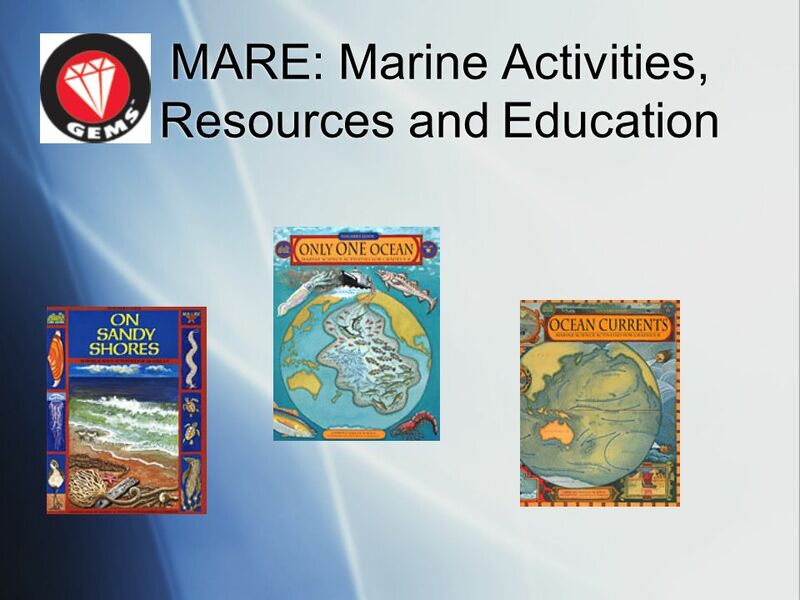 In collaboration with MARE (Marine Activities, Resources and Education), GEMS has published 3 ocean education guides. 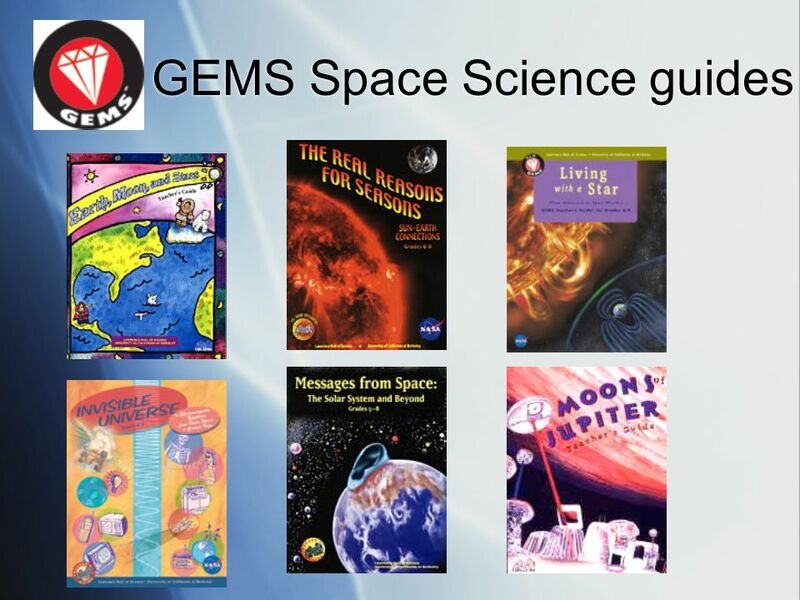 GEMS has also collaborated with NASA to publish space science guides. 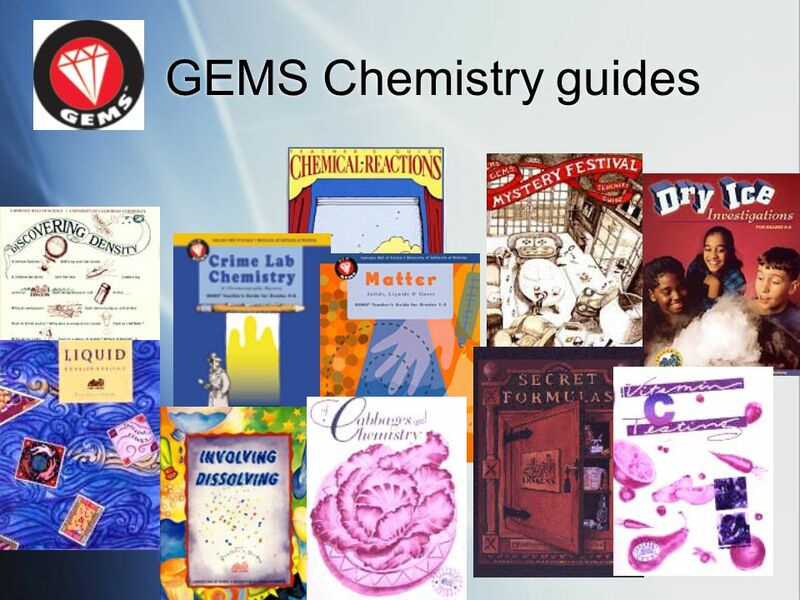 17 GEMS Chemistry guides GEMS also has published a selection of chemistry education guides. From Matter and Involving Dissolving for young children, through chemical reactions and Cabbages and Chemistry for older students. 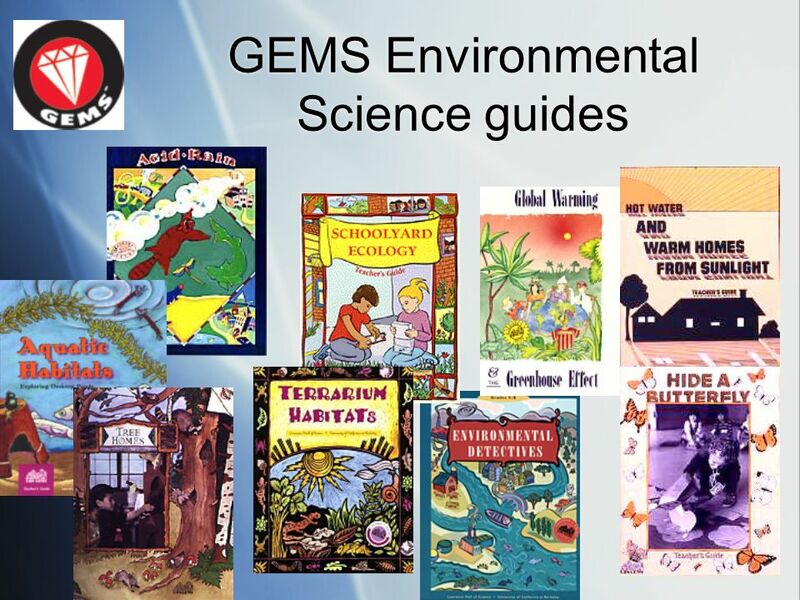 GEMS also has a selection of environmental science guides. 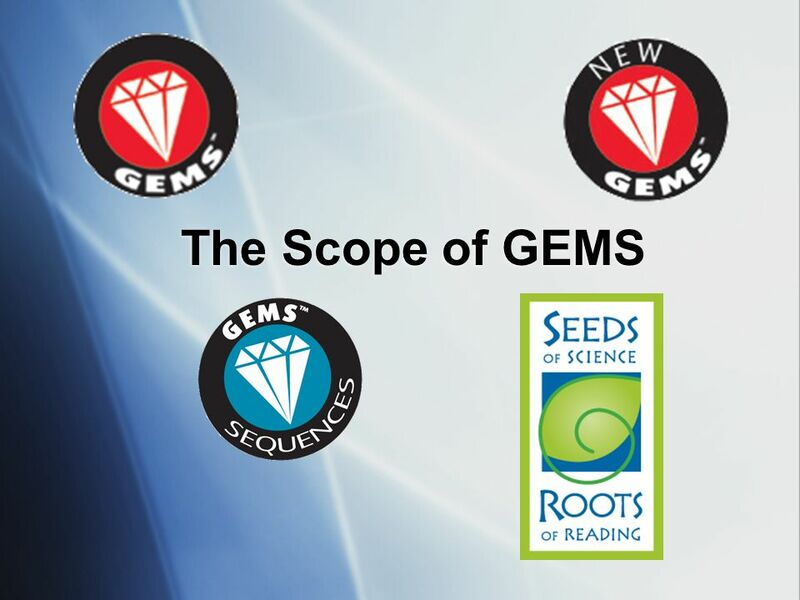 Download ppt "The Scope of GEMS I’m going to lead you through a quick overview of GEMS programs, with a focus on GEMS guides. Sometimes people ask, “what is the GEMS." 1 When DAP Meets GAP Promoting Peaceful Coexistence between Developmentally Appropriate Practice & the Need to Address the Achievement Gap International. In classrooms that promote number and operations you will see teachers… Consider arrival, departure, transitions, outdoor time, mealtime, rest time, and. Corporate Citizenship & Corporate Affairs © 2009 IBM Corporation 1 IBM CC&CA programmes IBM KidSmart Early Learning programme Overview of the Young Explorer. Welcome Parents to Our 4th Grade Class! Reading Foundations in Early Childhood Small Group Lessons. LearningGames and Early Childhood Curriculum Connecting Center-Based and Home Learning Using a Comprehensive Curriculum Hilary Parrish Product Development. “No Child Left Behind” Reports 2008 Jenkins Middle High School Jenkins Middle School. Marilyn Burns Classroom Math Library December 13, 2009. 1 When DAP Meets GAP Promoting Peaceful Coexistence between Developmentally Appropriate Practice & the Need to Address the Achievement Gap National Association. November, 2011 In-Service. What is Guided Reading? Guided Reading offers small-group support and explicit teaching to help students take on more challenging. Designing Effective Science Lessons Standards Cognitive Development Content Lesson Format Methodologies Effective Science Lessons. Early Childhood Best Practices in Literacy Development Essential Question: How does early literacy research and instructional standards enhance literacy. 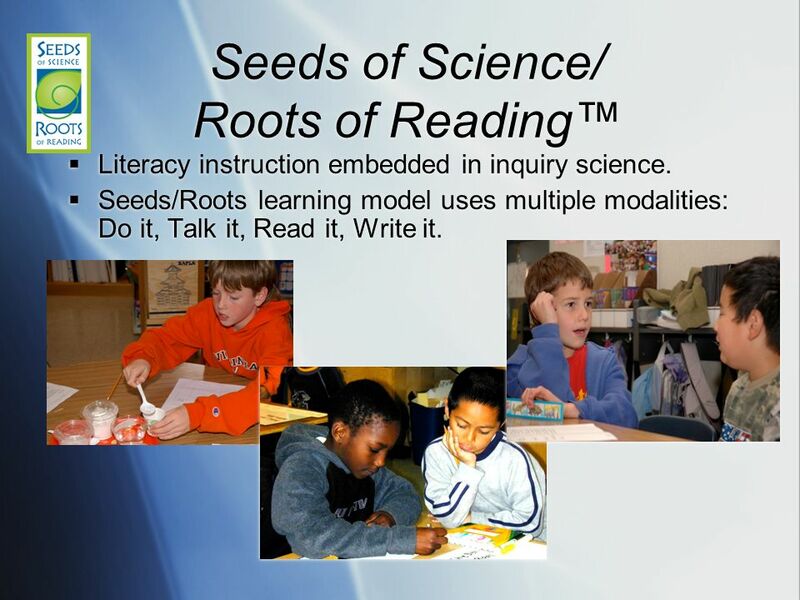 Presented by Laura Dailey Adapted from Lisa L. Hansen Interactive Science Notebooks. EngageNY.org Overview of the 3-8 ELA Curriculum Modules Session 1A, November 2013 NTI.